Driving to Tērvete, I suspect it might be a set-up. After all, I am writing in English, about Latvia and Latvians. There is a high probability I do not know what I am talking about. 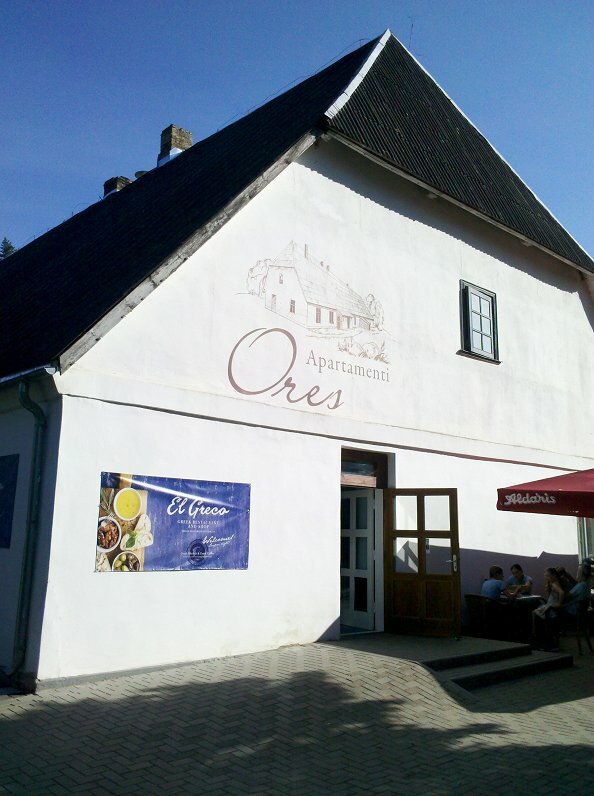 So meeting at the former home of one of Latvia's most famous writers, in Tērvete, a location loaded with historical associations dating back hundreds, and even thousands of years, in order to meet someone who has perfected the art of translation, would be a very good way of exposing my shortcomings. The house of Anna Brigadere, Latvia's foremost writer of children's stories, is now a museum and cafe. Sitting on the terrace outside I sip my coffee nervously and eavesdrop on a group of mixed Latvians and foreigners at the next table talking in various languages about how annoying English people are. They make some valid points. This could be a very long and painful afternoon. Kristaps Kvelde arrives. He is the man I am meeting. He looks friendly enough. “Hello, Mike, sorry I am late!” he says, extending his hand. It goes suddenly quiet at the next table. “Sveiks Kristap, prieks iepazīties,” I reply. “Ha, that'll confuse them on the next table,” I think to myself, confusing both Kristaps and myself in the process. And so we settle down to talk about Nordtext, the translation company Kristaps started in 2006. “I've always been into languages, international relations, different cultures and geography. I studied in Sweden for a while, then Latvia. I did some work for another translation company on a part time basis and immediately fell in love with the industry and how it works. After three months I ventured out with a partner to establish Nordtext,” he explains. In the subsequent decade, Nordtext has become one of the leading translation companies in northern Europe by concentrating on commercial, business-to-business customers and investing in technological innovation. It is a long way from the notoriously unreliable output of the “occasional” translator. Like me. While we talk, Kristaps' wife Estere comes over and asks if we will be going to the Greek cafe. I feel I must have misheard. Estere volunteers to get a takeaway to have at home instead. With the formal interview over, Kristaps and I wander around the surrounding landscape of ancient pines and even more ancient hill-forts of Tērvete nature park. This, ostensibly, is the place we have come to see, but apart from an impressive display of coordinated work put on by a nest of termites, it feels a little flat despite the hill forts. We are both thinking of Greek food. After a short drive we arrive at Kristaps' and Estere's country home, located on the banks of the river Svēte, where Estere has laid out an authentic Greek feast on a wooden table that would satisfy Socrates. “I'm not from here, but my wife is, for many generations. A few years back we started to really get into exploring our family trees. We knew a lot about my side of the family but less about hers. We started to dig deeper and look at what had been going on right here. No-one was taking care of it any more. It was overgrown and deemed 'lost' already, but with these feelings about family re-emerging when Estere was pregnant, we thought it could be saved and breathe new life into it. It took a while for me to feel the connection because it was not my place. But I found the more work I put into it, the more sweat and effort, I started to feel it become part of me,” says Kristaps between mouthfuls of souvlaki. 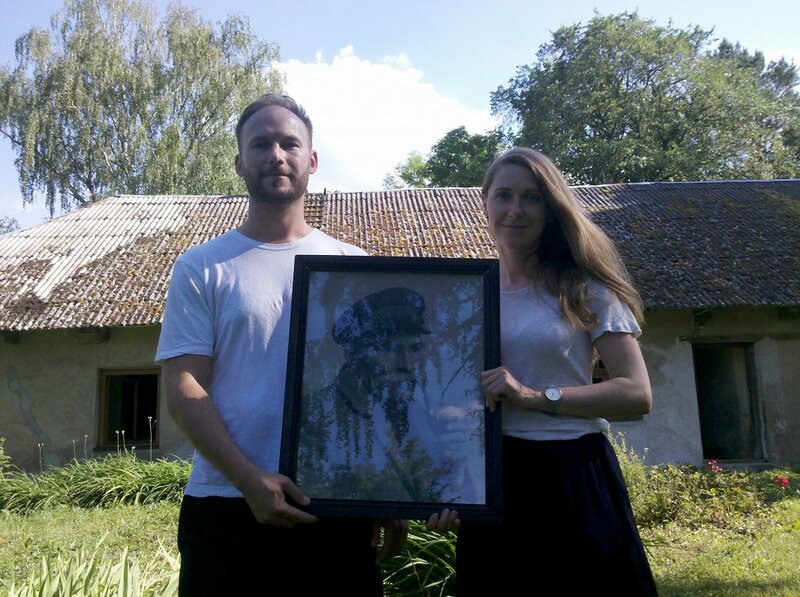 Kristaps and Estere with "Old Krieviņš"
It is tempting at this point to embark on a long, rapturous description of just what a beautiful place it is, with a restored meadow, a secret beach, a little wooden cabin and an elderly relative fluttering happily between the pots and pans in another renovated building. But it would seem like an imposition to describe too much of such a private place. It is in some ways like hundreds of other places in Latvia, yet, like each of them, is also unique in having this living connection to a specific family. For anyone else to live there would seem quite literally out of place. As if to underline this, a portrait of “Old Krieviņš”, the ancestor of the family, is dug out and held up for inspection. He looks quite at home and not a little proud as he puffs on his pipe through an impressive mustache. Perhaps it was the food, perhaps it was the company, perhaps it was the place, the Mediterranean weather or a combination of all these things. Whatever the reason, I decide I cannot begin the long drive home without seeing the famous Greek cafe for myself. After waving goodbye to Kristaps and Estere I drive back into Tervete and find a table on the flower-filled terrace of “El Greco”. It is an authentic and unlikely piece of Athens that has somehow been transported to southern Latvia, like a Corinthian column in a Rīga street. There is no-one on other tables complaining about the English here, just the owner lounging in the sun, surrounded by children who pepper him with questions in three languages. “Do you like horses?” asks a little girl. “Yes, but not as much as you,” he replies. “Do you like working?” asks another girl. A little boy says something I don't understand. Translation comes quite naturally in cosmopolitan Tērvete. Of course, the word “cosmopolitan” is derived from the Greek.